Take a break from the games to see Dallas like a local. From the perfect selfie to a food adventure, here’s what you can’t miss during your visit. Be the “I” in BIG, with a photo op at one of our many B&G’s sets around the city. These six-feet tall, blue letters are unique to Dallas and a great take-home for making your trip one to remember. 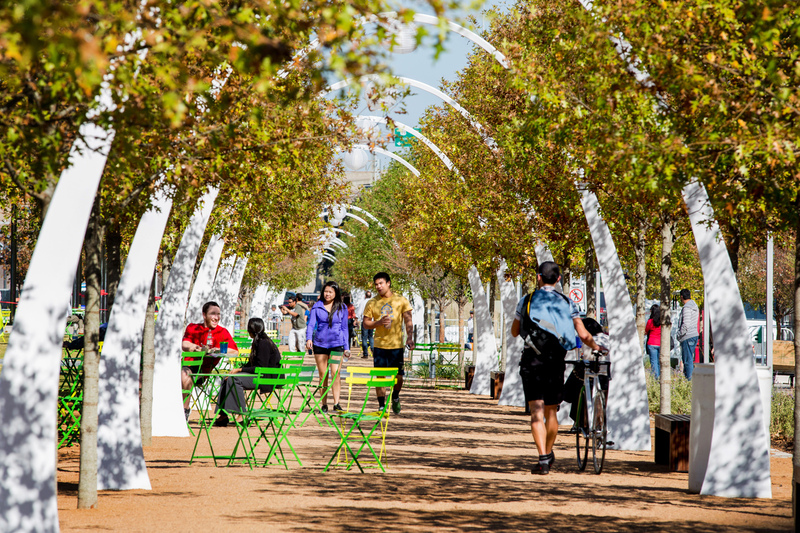 Connecting Downtown and the Arts District to Uptown, this 5.2-acre park sits atop a busy interstate, but you’d never know from the park’s massive green space and abundance of trees. The park’s busy activity schedule will keep you entertained with live performances, movie nights, a children’s park, a dog park and daily food trucks. Formerly a rail line flowing through Dallas, the Katy Trail is a beacon for walkers, joggers and riders through the Uptown and Downtown districts. Entrance points along the 3.5-mile trail will drop you off at the front stoop of some of Dallas’ must-see districts, restaurants and bars. Have a moment of serenity among celebrated sculpture at the Nasher Sculpture Center, or admire art for free at the Dallas Museum of Art or Crow Collection of Asian Art. From performing arts at the AT&T Performance Arts Center, striking beauty in sight and sound at the Winspear Opera House, or a magnificent performance from Dallas Black Dance Theater, there’s always something to experience in the Arts District. From the first planned outdoor shopping center at Highland Park Village to NorthPark Center, one of the best shopping destinations in the country, Dallas is a shopping treat. Browse an impressive array of designer stores, retail favorites and luxury boutiques before heading into The Shops at Park Lane, an equally remarkable spot for shopping staples like Bloomingdales Outlet, Nordstrom Rack and the first J. Crew Mercantile store in the country. Or head Downtown to the flagship Neiman Marcus store. The luxury retailer sits at the corner of Main and Ervay streets and includes the Zodiac room, a popular lunch spot on the sixth floor. The Galleria Dallas is home to the finest shopping in Dallas. Aside from the shops, there’s an ice rink located in the center of the mall where you can enjoy skating daily. Skate rentals and socks are available to purchase on site. The McKinney Avenue Trolley, a collection of vintage trolleys, offers free rides through Uptown, The Dallas Arts District and Downtown. Hop on and off as you explore! Or take a free ride from Downtown Dallas into Oak Cliff with the Dallas Streetcar. Jump on at Union Station with cars operating every half hour. D-Link, a free bus shuttle service, provides easy rides into Bishop Arts with plenty of pick up spots in Downtown. Experience one of the best views of Dallas. With Downtown just ahead and the majestic Margaret Hunt Hill bridge above, the Ronald Kirk Bridge is perfect for an evening stroll, complete with a visit to one of the food trucks that make a daily stop to cater to the crowds. Dallas has big ambitions when it comes to food! Thousands of restaurants throughout the city boast intricate menus, one-of-a-kind dishes and mouthwatering concoctions. Each entertainment district has developed a taste of its own. Grab a burger or a slice of pizza in Deep Ellum or take on fried oysters and deviled eggs topped with caviar in the Knox/Henderson district. More in the mood for a steak? Hit up some of Dallas’ best steakhouses in the Downtown and Uptown districts. Bishop Arts is the spot for all things local and sustainable, and the emerging Lower Greenville Avenue is home to some of Dallas’ hottest new spots. And you can’t come to Dallas without a taste of some barbecue from Pecan Lodge or Lockhart’s, followed by a Tex-Mex outing to the iconic El Fenix for your queso fix. Located in the historic West End of downtown Dallas is Wild Bill’s Western Store. The space is a 100-year-old red brick building with tin ceilings, hardwood floors and a massive turn-of-the-century bar complete with saddles as barstools. Get the latest boots, hats, apparel, and maybe even a story or two from Bill himself!